Fortnite Week 4 is now live, and has brought with it a whole host of brand new challenges, combined into the Fortnite Week 4 Challenges section you’ll come to once you’ve acquired the Battle Pass. In this Fortnite Vehicle Tower, Rock Sculpture, and Circle of Hedges guide, we’ll be revealing how to tackle the enigmatic Fortnite Season 3 Challenge, and how to reap the rewards of said challenge. In case you need anything else on Fortnite, including a complete Beginner’s Guide to the Battle Royale mode, as well as a guide on how best to win said Battle Royale mode, make sure to head over to our Fortnite Battle Royale guide hub. All the brand new Fortnite Challenges for Week 6 of Season 3 are now live in-game, so if you want a guide on how to complete all the new complex challenges, make sure to head over to our Fortnite Week 6 Challenges guide. Firstly, you’ll want to check up on the Fortnite Week 4 Challenges that are available to you, and to do this you can firstly head into the ‘Challenges’ tab once you’re in the Battle Royale section of the game. Now scroll down to Week 4, which is the week currently in the rotation at the time of writing, and select it to be taken to a list of Week 4 Challenges. Should you fulfil all of these challenges by the end of Fortnite Week 4, you’ll be granted 4,000 XP, so it’s entirely worth your time. However the one challenge that presents the biggest obstacle in Fortnite Week 4 is the ‘Search between a Vehicle Tower, Rock Sculpture, and a Circle of Hedges’ challenge, which is graded as Hard by the game. Since these aren’t the most accurate instructions to work with in finding the treasure, we’ll be guiding you to the exact spot at which you can find the Bronze star that you’ll be collecting. 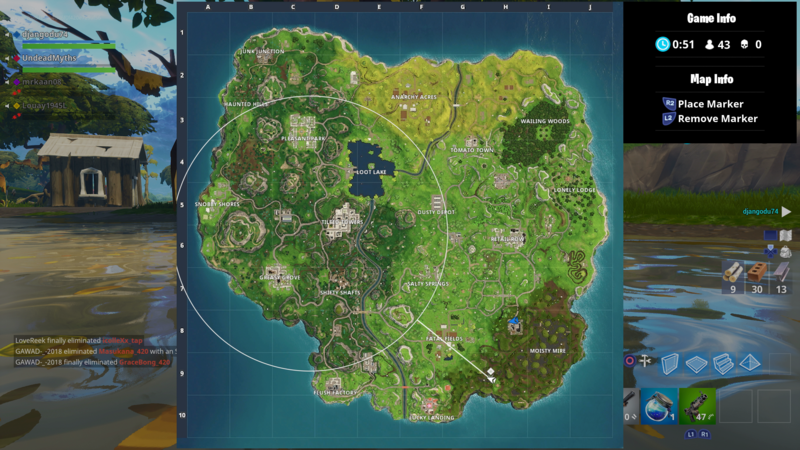 As you can by our map pictured just below, you need to be south east of Fatal Fields, and in the south west reaches of the Moisty Mire area. What you’re looking for is a large section of water, with two decaying trees nearby. If you’re looking north west, then you should be able to see a hill in the background, as you can also see by our screenshot of the final treasure location just below. 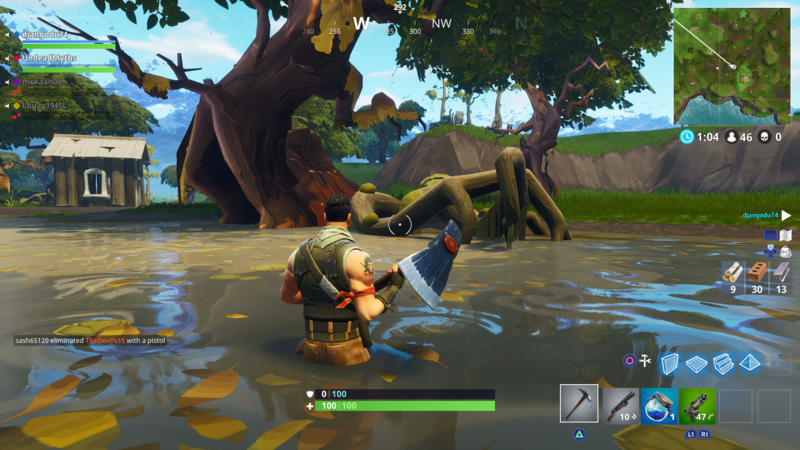 To uncover the actual Bronze star for you to collect, you simply need to explore around the north-most tree on the edge of the pool of water, as well as the fallen down branches residing in the actual water. Once you’ve done this, the Bronze star will eventually appear, and to collect it all you need to do is walk up to it and hold down Square/X. 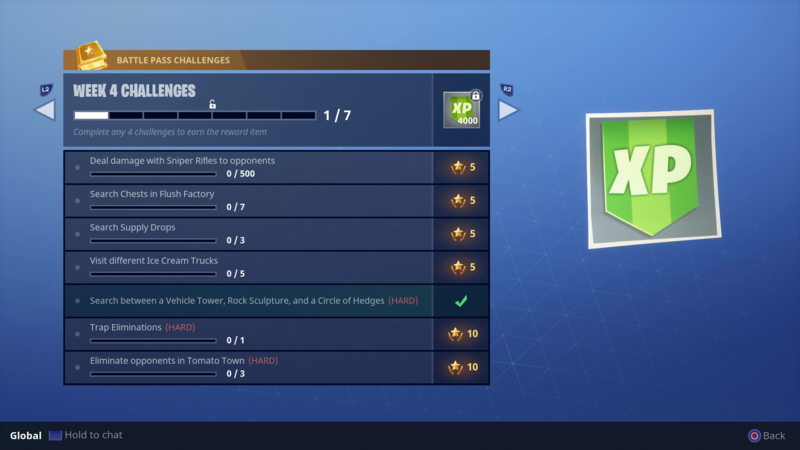 We should note that to actually count the Vehicle Tower, Rock Sculpture, and Circle of Hedges challenge as complete, you’ll need to complete the actual match of Battle Royale you're playing, so simply die at your earliest convenience, and Fortnite will count the challenge as having been completed. Now that we're all done with this guide, you can head over to our Fortnite skins page, where we'll list out all the very best, most stylish outfits you can possibly purchase for your Battle Royale character, or our Fornite V Bucks guide, for info on how you can earn V Bucks as quickly as possible.